Unicorn To Decacorn Status: When Did The Companies Hit $10 Billion? The term ‘unicorn’’ – referring to a privately held startup company valued at over $1 billion – was coined by venture capitalist Aileen Lee in 2013, choosing the mythical creature to represent that statistical rarity of successful ventures . As of January 2019, there are more than 300 unicorns around the world . A variant of ‘unicorns’ is a decacorn, referring to companies valued at over $10 billion. There are currently over 20 companies in the ‘Decacorn’ club and it’s predicted that this figure will increase to 30 companies by 2021. The coming year is expected to be shaped by Decacorn IPOs  – but exactly how long does it take to reach Decacorn status? RS Components have investigated how quickly it took some of the world's leading businesses to go from Unicorns to Decacorns. You can view the graphic here. On average, it takes 5 years and 6 months for a company to become a Unicorn (from when it was founded), compared to an average of 2 years and 6 months for a Unicorn to become a Decacorn. However transportation network giant Uber, founded in March 2009, reached Unicorn status in August 2013, only 4 years and 5 months after starting up. Uber offers services via websites and mobile apps including ridesharing, on-demand taxis, and food delivery, and the company has operations in 785 metropolitan areas worldwide. The on-demand transport service, currently valued at $68 billion, reached Decacorn status only 10 months later in June 2014, much sooner than the global average. Similarly, Didi Chuxing, currently worth $56 billion, is a Chinese ride-sharing, artificial intelligence and autonomous technology conglomerate. Headquartered in Beijing, the company offers services including taxi and private car hailing, social ride-sharing and food delivery to Chinese users via smartphone. Didi Chuxing reached decacorn status only 6 months after reaching unicorn status in December 2014, 2.5 years after being founded. Pinterest, the image-led social media platform currently valued at $12.3 billion, reached Unicorn status in May 2012, just under 2.5 years after it was founded. It took another 5 years to reach Decacorn status in June 2017. The site was founded by Ben Silbermann, Paul Sciarra and Evan Sharp, and allows users to share and save images, GIFs and videos. As of October 2018, Pinterest reached 250 million monthly active users, despite rejecting Silicon Valley’s stereotypical unicorn formula of ‘chasing growth at all costs and bragging about every victory’ . 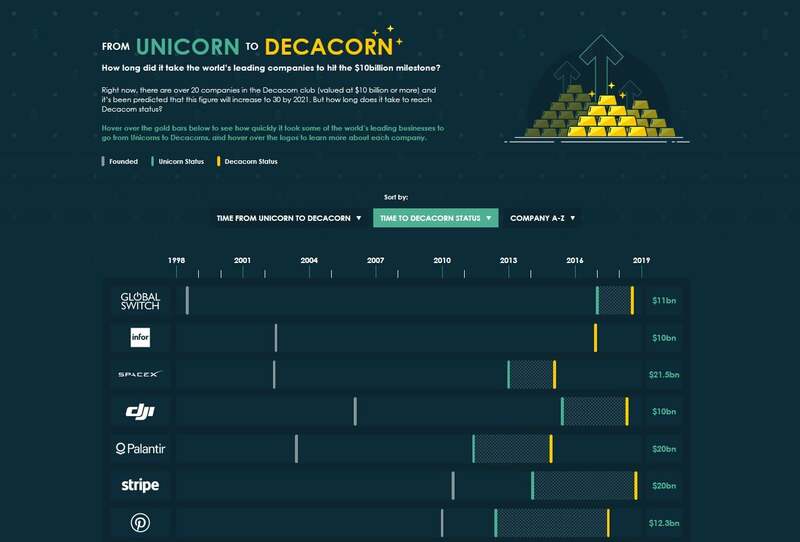 Other notable mentions of the Decacorn club include WeWork, a global network of workspaces founded in February 2010 that reached unicorn status 4 years after being founded, and decacorn status only one year after that in June 2015. In addition, Bitmain (a manufacturer of circuit chips for cryptocurrency mining), internet software and services company Infor, and Toutiao (a news and information content platform that uses machine learning to personalize data) all incredibly managed to reach unicorn and decacorn status in the same time. Which companies will reach Decacorn status next? View all of the current Decacorns, and the time it took them to hit the $10 billion milestone in this graphic here.